I am so excited because my little sis, Kristin and her kitty, Scooter are coming home for the Thanksgiving holiday tomorrow! My sister is in grad school at Western Michigan University in their Physician Assistant Program. We don't get to see as much of her because she is SO busy with school this year. Kristin is my only sibling. I'm thirteen years older. Even though there is a large age difference, we are very close. I keep telling her that I'm getting younger and she's the one getting older! HA! The neat thing is Kristin is exactly thirteen years older then my daughters and the three of them also have a very special relationship! They worship her. Kristin graduated with her undergrad from Western Michigan last May and I planned on giving her a quilt for graduation. Well sometimes as quilters, we miss deadlines. Don't know if any of you know anything about that?? I decided to start her quilt over the summer thinking I had more time. Nope, I sure didn't, but I started it...about half is pieced. It is a variation of an Irish Chain pattern made with jelly rolls. I used jelly rolls from the fabric collection Boutique by Chez Moi. I love the traditional look of the pattern with the more contemporary fabrics. I was a little on the fence with the fabric at first, but thought Kristin would love them. I love them too now! The pattern is called "Daisy Chain" from the book Jelly Roll Quilts by Pam & Nicky Lintott. I love this book. I made a few quilts from it when I was on my jelly roll kick. I am changing the pattern a bit to include some applique in the borders. Not sure what I'll design yet. Kristin really admires quilts with applique and she loves jelly rolls...fabric and other wise! Scooter stays with us from time to time when Kristin is away from home. Sarge just loves it not so much when Scooter comes to visit. 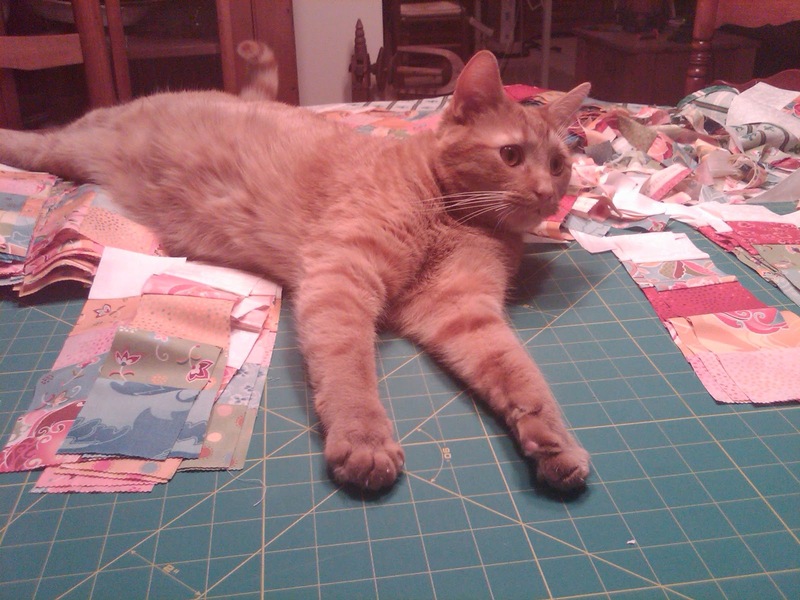 If you noticed that my blocks look a little wrinkled, yeah that's because Scooter just loves to "help" me quilt! After a night of getting a little "kitty krazy." Anyone who has cats knows what I am talking about. This is what I refer to as "quilt salad," it's Scooter's specialty! So I put the project away until Scooter went home. Now I tell Kristin maybe she'll get a quilt for graduation from grad school! There's still time to get in on my giveaway! The polls don't close until 9 PM tonight! LOL about your kitty salad. I have three and they drove me so crazy at night I had to put them into their own room. Now they seem to go to sleep. Nothing to get into trouble with. :) Love the Irish Chain and can't wait to see what you put on the edge. Enjoy your sister! Seeing your fun kitty makes me miss mine. What a hoot!! The quilt is fantastic and I'm sure she'll love it. Have a wonderful Thanksgiving!! BTW, I only have one sibling, as well, and she's 16 years younger. She and my only daughter are only 5 years apart. 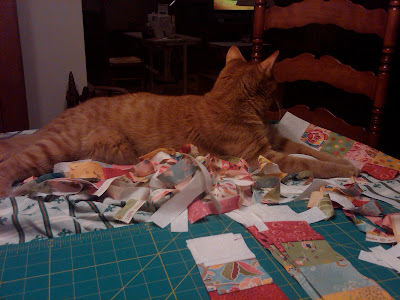 You quilt is looking awesome....I made about three quilts from that fabric line. In fact my daughter who is home from school sick is snuggling up on the couch with a charisma quilt....about my crock pot chicken..Yes on high. Love the Daisy Chain quilt! My youngest sister is 13 years younger than me too. She was just a little girl of 8 when I married my husband. Thank you sis for the great post! I love you guys sooo much and cannot wait to see you on Wednesday!! Love your Daisy Chain...your sister is going to be THRILLED! Love the kitty pictures! The quilt is beautiful and your sister will love it. I have to keep my kitties locked out of my sewing room, they are just too obnoxious. I hope you and your family have wonderful Thanksgiving. Very pretty, beautiful colors. 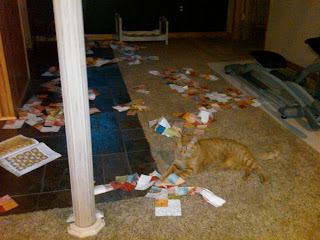 Aren't kitties fun, and oh, so helpful?